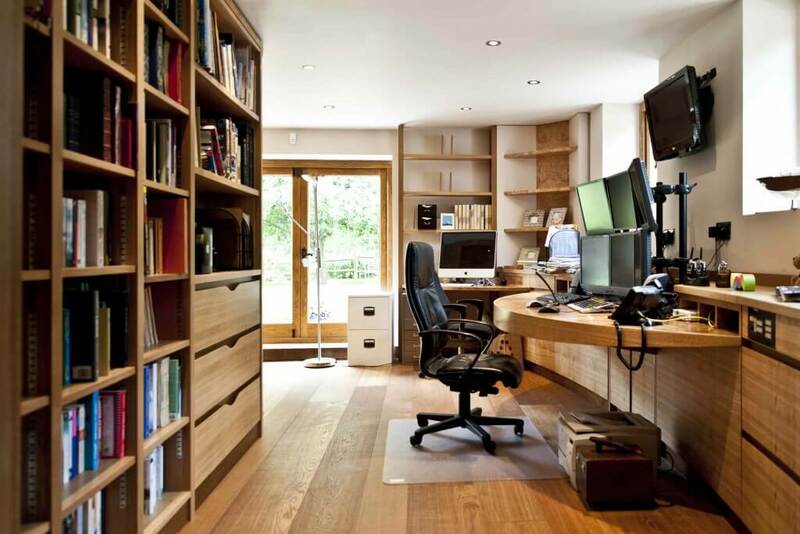 It is situated in an adjacent converted barn, close to the house and is actually two very different projects under one roof; one a home office / study, the other a large bar / cinema / entertaining area. Lets start with the bar. It’s great when I get a client who loves colour, so often these days people go for safe mono-tonal, muted colours. Nothing wrong with that, but strong colour makes wood come alive, and lets face it this is an entertaining space, somewhere to have fun. 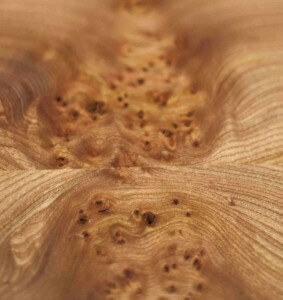 In the end we selected two of the ‘Tabu’ coloured veneers – a vivid blue madrona burr and a man made dark brown check. This was combined with some really beautiful native elm, the three just bounced off each other like some early nuclear fusion experiment. 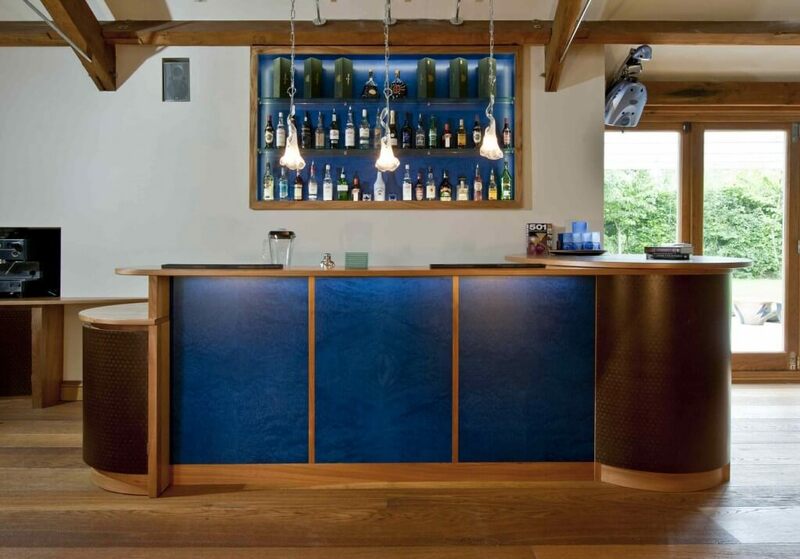 There are shared details and design themes that work across the bar, office and kitchen spaces. The obvious one is the D-end curved cupboard unit which is constructed and detailed in the same way the kitchen island ones. 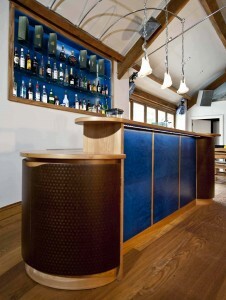 The clients loved those soft end curves, they make spaces flow and somehow feel sociable to gather around, important for an entertaining space.We used lots of LED warm white lighting on this area and used this to pick out the blue madrona burr on the front of the bar and the bottle shelving recess behind. The bar does contain a sink, stainless work-surfaces, cocktail mixing trays, glass shelves, ice maker and a drinks fridge, everything you would ever need to keep the party going until the early hours. 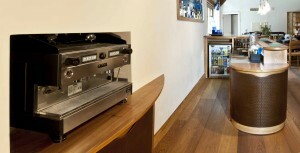 For those who have perhaps had one or two too many there is a proper Gaggia coffee machine on another cabinet which is built into a wall recess just a few metres away from the main bar. All the cups, grinders etc are kept in the curved door cupboard below and there is enough elm work surface to line up the cups to keep the guests going for another hour or two. What you don’t get from these images is how this space works at night when the party club lights are on, or the big cinema screen at one end of the room. 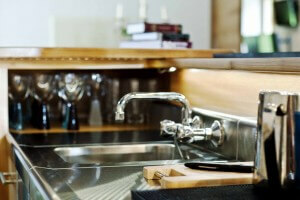 It’s a multi-functional space for a pretty multi-functional family. I suspect as the 4 children go through their teens and early adulthood it will be a very popular place to be! …it’s an office, for someone who works in the city, but somehow through the wonders of technology can now do it from North Dorset. The idea behind this space was more gentleman’s club rather than the nightclub of the space next door. 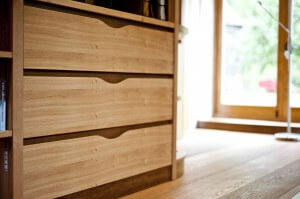 It’s a modern twist on a panelled room with subtle oak, burr oak and fumed oak combinations. The day we came the clients were just moving in so it looks a bit of a riot, saying that it looks a lot like my office. We weren’t even planning to take shots in the office but it somehow captured the spirit of a busy workplace. 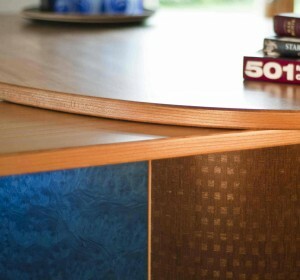 The main desk is a canter-levered curved burr oak surface with a drawer that protrudes from a 6 metre run of concave storage units with doors and drawers in, as well as loads of complex technology behind those 6 trading screens, multiple phone lines and 2 TV’s. 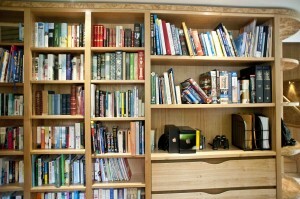 There is a more intimate secondary desk area in the corner as well as a set of shelves with built-in sliding bookends. On the other side of the room is a long set of bookshelves and storage which end at a set of curved burr oak display shelves. 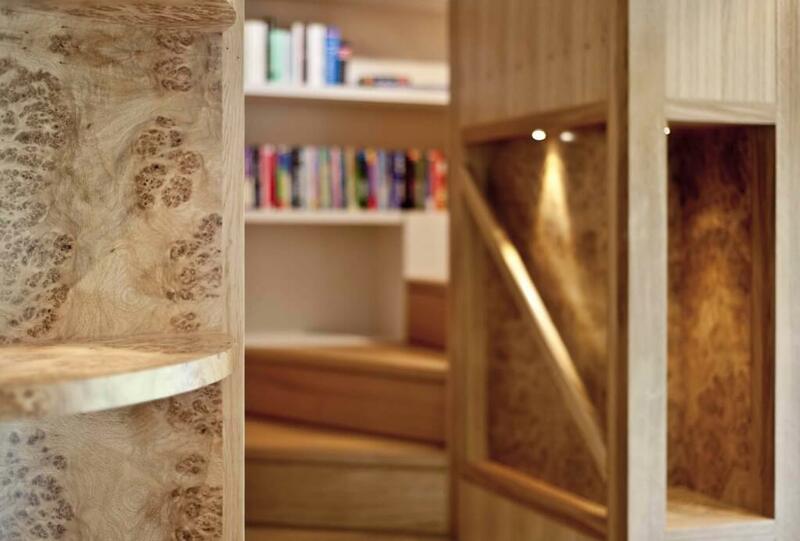 These give another one of our soft lead-ins to the surprise of the room – a bespoke oak staircase that rise up to a mezzanine snug / reading area. This was the real challenge of the whole project, not just because it was the first staircase we had designed and made, it is also integrated with alcoves and shelves. 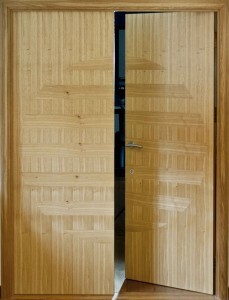 As is often the case, the simpler something looks the more technically challenging it is to make. That was certainly true in this case.